So I'm a soccer mom now! 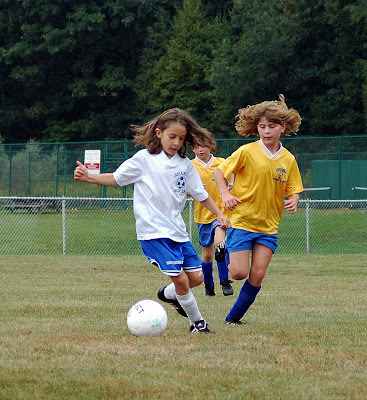 The Sharon rec league U-10 girls played Cornwall on Saturday, and got beat, 5-1 or was it 6-1! My daughter (in white here) scored Sharon's only goal and was she ever proud! This is her first year playing on a team, and I think she's got a knack for it, if I do say so myself! (and I do, since I'm the mom!) The main thing is the team has great spirit, everyone has fun, and plays hard. Great photo, we are big football fans. Love the photo, Jenny! It's a wonderfully healthy sport and great body conditioner. I know she'll love the games.